M-Audio Axiom 49 - "Very Satisfied!" 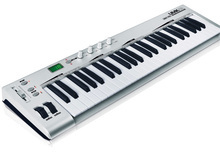 Korg K49 - "Korg K-49"
Alesis Q49 - "Great entry level midi controller." Behringer U-Control UMX490 - "Very good value for money"
M-Audio Axiom 49 - "M-AUDIO Axiom 49 Key MIDI"